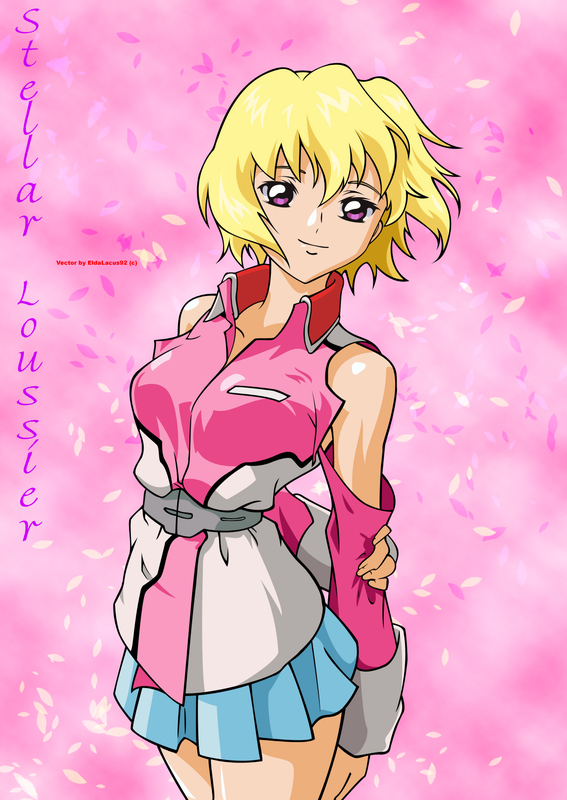 Mobile Suit Gundam SEED Destiny: . :Smiling Stellar:. Minitokyo »	Mobile Suit Gundam SEED Destiny Indy Art » Mobile Suit Gundam SEED Destiny: . :Smiling Stellar:. Well Enjoy! Comments are always welcome! I'm sorry but I couldn't find the original image... But If I'll come to cross with it I'll promise to link it here! First one to comment here. Another nice vector from you, my friend! Yup, I totally agree with yah...Stellar's really cute here especially with that smile. And also, the pink bg is pretty too. Great vector as usual, EldaLacus! Though... I'm not a Stellar fan.. she's cute in this vector! Ganbatte, ne! P/S: Good to have you back! I like the background here! Its really fits the image! this is favs for sure! Keep it up my friend! Kawaii! Stellar looks best when she smiles and poses like that. She's so hot. I must say that this is one swell fanart! The vector art is pretty cool too. Wow this is a very cute picture of Stellar, its so beautiful! This is one of the best, It's going to my favorites immedietly! Awsome job!